Two divisions with a singular commitment to you. 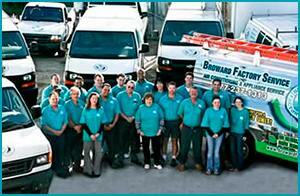 Since 1973, Broward Factory Service – our heating, ventilation, and air conditioning (HVAC) services division – and BFS Home Warranty – our HVAC equipment repair & replacement division – have worked together to provide your family with peace of mind and indoor comfort. Today we have 18 offices in five states, with some offices emphasizing one service area over the other. But all draw upon the substantial corporate expertise available to all offices, to ensure that our customers can get all the HVAC services they need from BFS. We invite you to learn more about our history, and what makes us different than other (usually smaller) HVAC companies. Our company’s mission, values, and objectives flow from the top, which is why you might like to meet our management team. Yet our daily customer service and satisfaction is directly related to the dedication and professionalism of our high-quality employees. If you think you’re good enough to join their ranks, we’re excited to find out about you and ask you to apply for employment today! BFS provides HVAC, home warranty, and finance services to families in Florida, Texas, Arizona and Nevada. Call us today at: (877) 237-9700 (our nationwide number).